C.C. 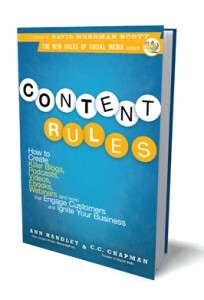 Chapman, co-author (along with MarketingProfs’ Ann Handley) of Content Rules, kicked off his book tour at Social Media Breakfast in Ottawa this morning. Though just a tad bleary eyed at 7:30am, I was very excited to meet the man who creates the content that I read and listen to quite regularly online, and to receive a copy of his new book, which hit shelves in the US just over a week ago and has not yet formally arrived in Canada. All of the tools that you need to create great content are available at your fingertips, so use them. Remember that content is so much more than just writing, blogging and video. You can publish pictures on Flickr, record podcasts and direct people to other newsworthy material in your industry, for example. You have a story to tell and no one knows it better than you. Also, if you start creating content without a story, no one will care. Teaching others how to tell good stories in various ways is difficult because there are no right answers and context and perception shift continually. Use experiences from your own life to channel your own voice. During the content creation process, keep in mind both the elements of a story and the tools that encourage people to share and keep coming back for more. For example, if you are writing about an event, be sure to link to similar events or other things happening in and around your community. Get other people excited about what you have to say by getting excited about it yourself. Asking yourself why it matters to you is a great place to start. This is the simplest yet easiest rule to forget, says Chapman. Buzzwords, while sometimes significant, actually distract audiences from the real message of your content. The key is to be honest and direct. If your brand or business is in crisis mode, you’ve got to talk to people on a human level to build the trust back. Creating unique and interesting content takes time and planning. Chapman advises us to start a content strategy on something small coming up, such as an event or product launch. Measure it closely to see if you are getting the results you are looking for. If what you are doing works, build on it. Ask yourself why you are doing something and how you are going to measure success. There is no silver bullet approach that will make you successful. Don’t pimp your products and services. Help people instead. Create content that solves a problem that people can get excited about. This builds up trust and encourages people to remember you when they need help in the future. This is a core storytelling technique that upholds the age-old saying that “the proof of the pudding is in the eating.” People are much more likely to believe you if you prove it to them. Don’t just tell people that everyone loves your product or service; show them somebody who is genuinely happy because you helped them solve a problem. Figure out what would surprise your audience, and do it. Whether you’re being fun or just plain silly, you can really capture your audience if you know what tickles their funny bones, captures their hearts or gets their minds cranking. If you do this well, you prove to your audience that you know what makes them tick. You have to keep fueling the content fire for your audience or they will go elsewhere when it gets dark. Think long term here. While building a bonfire may work temporarily (think viral videos), people won’t hang around once the fire runs out and it will be a lot harder to convince them to come back. Do not depend on rented land like social media platforms because they could all go away tomorrow. Make sure you own your own property. To be safe, put your blog on your website and then set up your outposts on social media sites. Just look at the recent case of Tumblr‘s outage to see how everything can go haywire. Figure out what you’re good at and what you’re passionate about. Don’t just feed the beast. Building online communities around your content is a long-term commitment, and things could go very wrong if you run out of good content. I’d love to hear your thoughts. Please share them here. The joke about the exclamation point was actually we thought about putting it on the cover to drive home the fact that it was more about the content RULING then about RULES, but the publisher (and us) thought better of it. Looking forward to seeing how you and your community put these Content Rules into practice. Thanks for stopping by and reading Mr. Chapman. I really did enjoy the presentation and took home a lot, as you can probably tell. My apologies for misunderstanding the joke. It was quite early and so my usual quick wit hadn’t clicked on yet (kidding). I’m more than happy to change that bit if you feel that it is misrepresenting. As Community Manager for this blog, and a new one that will be launching soon called FrancisMoran&associates, I plan to take to heart all of the lessons that I learned from you, both from your presentation and from your book, which I started reading as soon as I got my hands on it this morning I’ve been hearing a nice buzz from the Ottawa community about Content Rules already, so I’m sure it will become a great success.